* On/off switch and auto shut off. * Salon length swivel cord. 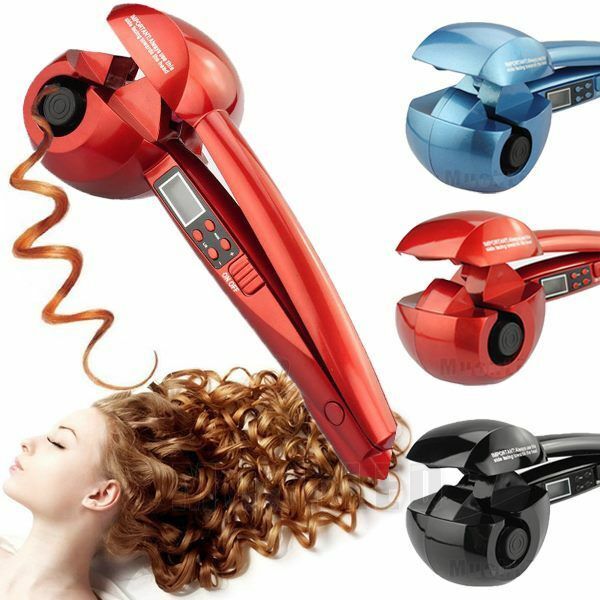 * Ceramic curl chamber for smooth curl creation. * LCD display, simple and convenient operation. * A variety of timer settings, different curling effect. * A plurality of set temperature, 140℃ to 230℃ temperature adjustable. * Powerful heating, system ready to use in seconds with ultra-fast heat recovery. * Curl direction control for either a uniform or natural finish(Right/Left/Auto). * Suitable for shorter and longer hair length. Suitable for hair type: Natural big waves, medium-sized curl, charming little wavy hair style, etc. Take 1-3 cm wide hair straight through the hair curler V mouth. Press the handle, hair will be curled automatically, wait for warning tone. After hearing the alarm beep, loosen the handle and release curly hair. Always ensure that the hair is clean, dry and combed through and that the sections you want to curl are no bigger than 3cm wide. The type of curl will depend on the temperature selected, and timer setting which dictates the amount of time the hair is kept inside the curl chamber.